California Bengal Rescue View other Bengals for adoption. 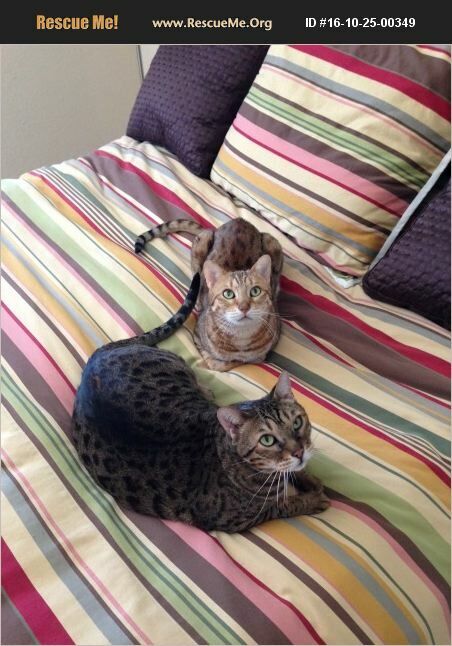 Gris (golden) and Nior (chocolate) are 4th generation Bengal brothers. They are 12 years old and have been part of our family for almost 8 years. We have a 21 month old toddler who is a bit too rough with them and I recently found out I'm allergic to cats. Nior is in excellent health and is more like a domestic cat, very chill and keeps to himself, loves to sit on your lap, plays, etc. Gris has had some health issues over the years but specifically IBS. We have him on special food which has kept him healthy but he's also on kitty Prozac for some urination behavior issues he had in the past. The Prozac though has kept it under control. Gris needs a lot of attention - he's a real lover, wants to be in your lap all the time, talks to you, will play fetch, etc. He's definitely more wild and exotic than his brother. Both cats are declawed and have lived indoors their whole lives. They're amazing cats and we'll be sorry to see them go. They must go to a loving home.